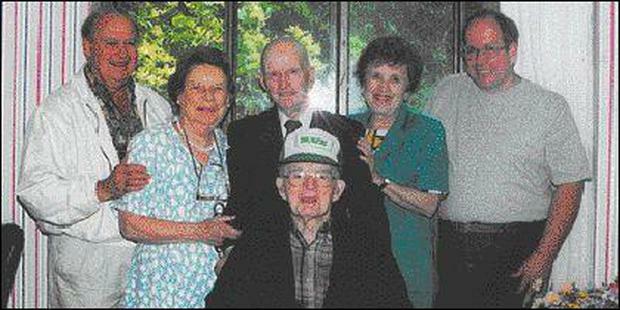 James Hanlon, seated, sporting his Carlingford cap, with his son Kevin, Peggy and Joe Finnegan, his daughter-in-law Gloria and John Topham. A native of Carlingford may well be able to lay claim to the distinction of being the worlds oldest living Irishman for next month James Hanlon will be 109 years of age! Massachusetts is where James now lives having left Carlingford as a 19 year-old back in 1911. His family used live where the chemist now stands across from the Village Hotel. Just as remarkable as Mr. Hanlon’s great age, is the chance meeting which led to another Cooley man, living in America, finding out about him. Joe Finnegan is originally from Carlingford and emigrated to Boston many years ago and met and married his wife Peggy out there. During the summer, while on retreat, Joe was helping a blind man down the stairs and when he heard Joe’s Irish accent, he asked where he came from. Joe and Peggy made contact with Kevin Hanlon (71) soon afterwards and had a nice chat with him. He said his father would only be too happy to meet them. Kevin reported he was in good health, except for his legs and required a wheelchair to get round the nursing home he was staying at. ‘The man we met was amazing. If you didn’t know any different, you would think he was in his early 80’s or even late 70’s,’ said Peggy. ‘He was a fine looking man, had a memory that was astounding, and apparently is the oldest and healthiest person in the nursing home,’ she continued. James was able to recall streets in Carlingford, Dundalk Street, Newry Street, Tholsel, as well as Castle Hill and Chapel Hill. He talked about looking across the lough to the Mourne Mountains and taking the boat from Omeath to Warrenpoint. He also recounted tales of going fishing with his grandfather and told his visitors he used drive Dr. Finnegan around in a horse and buggy. Last year Mr. Hanlon celebrated 80 years marriage with his wife Florence (101) who, sadly, has since passed away. She first saw her future husband in 1915 while travelling on the tram to work in General Electric Co. in Lynn, close by Saugus and was married in St. Margaret’s Church on 5th October, 1919. They subsequently had a son and daughter. James had found a job doing menial work on the floor of the GE plant, but by the time he retired 43 years ago was night supervisor at the Lynn and Everett plants and had 2,200 people under him. Florence - born in England and raised in the States - quit her job in the GE accounting department as soon as she got married and stayed at home to raise her family. He celebrates his 109th Birthday on 15th October and would be delighted to receive cards at the following address: Mr. James Hanlon, Annemark Nursing Home, 133 Salem Street, North Revere, MA 02251.